All these particles, it turns out, catch a wave. 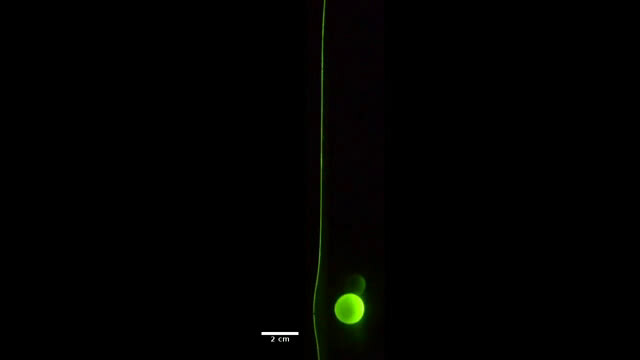 In the experiments, liquid flows around a moving particle. That flow, in turn, pushes on the adjacent sheet, deforming the surface into a sinusoidal wave with a depression and a hump. The stream of liquid into the depression and over the hump repels the particle away from the sheet. As the particle continues moving, it 'surfs' the wave and picks up speed, researchers reported online September 16 in Nature Physics. 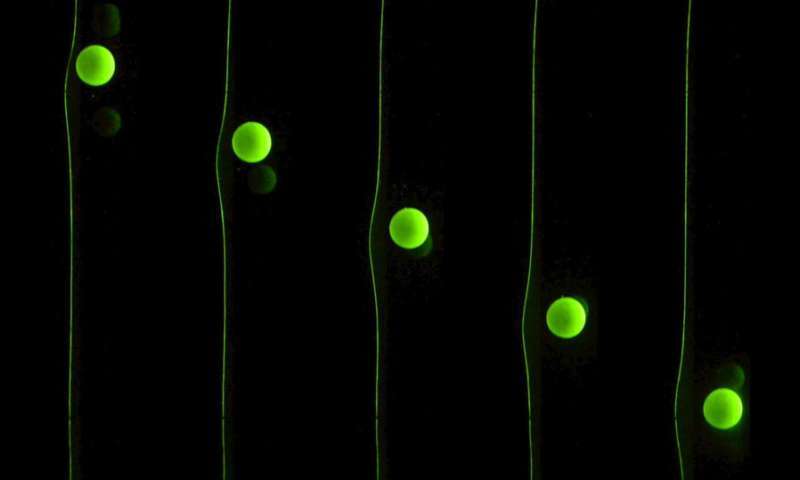 The finding offers not only new insights into biological processes, but a gentler method for measuring the elasticity of cell membranes and an easy way to sort particles by size. "It's a simple idea with big implications in biology and engineering," says study coauthor Naomi Oppenheimer, a research fellow at the Center for Computational Biology at the Flatiron Institute in New York City. Calculating the fluid flow of particles and flexible surfaces submerged in the viscous liquids of the body is incredibly complicated. Viscous liquids have strange properties: Their molecular makeup generates a large amount of internal friction and resists turbulent flow. Inertia, usually a factor in objects moving through a liquid, therefore doesn't play much of a role for objects traveling through a viscous fluid. A submarine cruising through seawater will continue moving for a while once its engines shut off, whereas the same sub would come to a near-immediate halt in molasses. Oppenheimer, Bhargav Rallabandi and Howard Stone of Princeton University, and Matan Yah Ben Zion of New York University sidestepped the problem of directly calculating fluid flow. Instead of trying to perfectly model the complex fluid dynamics, the researchers focused primarily on the forces acting on the particle and the surface. This approach yielded a relatively simple equation incorporating the viscosity of the fluid, the rigidness and tension of the surface, and the size and velocity of the particle. The researchers tested their formula with a real-world experiment. They dangled a thin rubber sheet in a fish-tank-sized container filled with silicone oil, which is roughly 1,100 times as viscous as water. One by one, they dropped marble-sized balls into the oil near the sheet and tracked the resulting movements as the balls sank. Just as expected, each ball produced a wave on the sheet, which in turn pushed the ball further away. As it moved farther away from the sheet, the ball experienced less friction, speeding up its descent. "Both Bhargav and I are theoretical scientists, so this was the first time we've done an experiment," Oppenheimer says. "Seeing the calculations we made materializing for the first time during the experiment was an amazing sensation." Bigger balls traveled farther away from the sheet. Pushing particles along a flexible surface in a viscous fluid could, therefore, be an easy way to sort particles by size, similar to an automatic coin-sorting machine. Similarly, the less rigid the surface, the stronger the repulsive force acting on the balls. This effect could help scientists measure the rigidity of a material such as a cell membrane without using conventional approaches that require potentially damaging poking and prodding or carefully controlled temperatures. The researchers plan to model more complex scenarios, such as the movements of multiple balls or multiple flexible sheets at the same time.